Cholla residents Bill Hensler, Lowell & Frankie McCulley, Dave Redden and many friends are out on their annual spring cruise on the Sea of Cortez. Cruises are organized around an annual cruising sail boat festival in Puerto Escondido south of Loreto on Baja. The cruise is organized into legs with different crews on various legs. 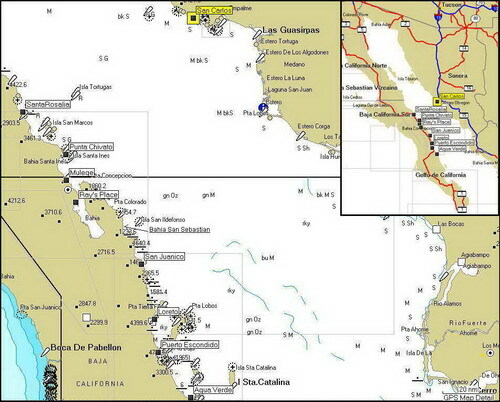 Bill and Dave completed the first leg sailing from Puerto Penasco to San Carlos April 16th – 26th. Lowell, Frankie and friend Steve Quant are currently sailing to Puerto Escondido from San Carlos, expecting to arrive at “Loreto Fest” May 3rd. To read about their cruise and follow their progress on their sailing blog click on www.gatolocosailing.com/blog/?cat=3 The blog is organized to show their most recent “Update” and you can navigate to the opening introduction Update..
Photo posted here is their catamaran Gato Loco in Vee Cove on Isla Carmen off Loreto, Baja taken May 3rd..